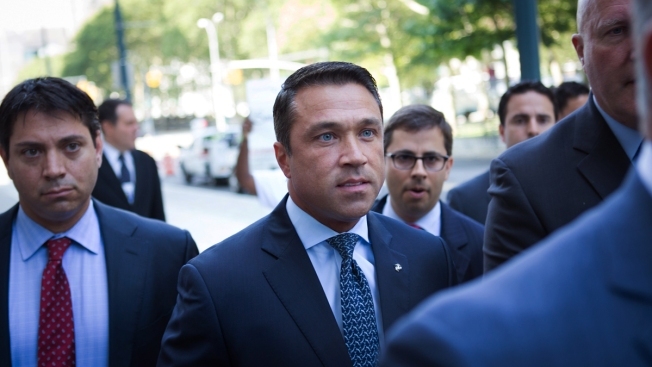 Former U.S. Rep. Michael Grimm, center, arrives ahead of his sentencing at federal court Friday, July 17, 2015, in the Brooklyn borough of New York. In an interview, Grimm said that his experience as an inmate at a federal penitentiary in western Pennsylvania was a "horrible experience" that he wouldn't wish on anyone. He came to Congress with the law-and-order image of a former FBI agent and left as an admitted tax evader headed for prison. His tenure was shadowed by a campaign fundraising investigation and punctuated by a threat to hurl a reporter off a Capitol balcony. But former U.S. Rep. Michael Grimm says voters want him back in Washington, and on Sunday, he announced he's going for his old job. Grimm told a crowd of about 100 supporters: "Together we'll go to Washington and have our president's back." He attacked the man he's trying to unseat for the Republican nomination, Dan Donovan, a former prosecutor who won the Staten Island-based district after Grimm resigned in 2015. Grimm chastised Donovan, saying, "The swamp still needs to be drained. Let's start right here with my opponent." In a country with a history of political comebacks, Grimm isn't following the script of asking for second chances. He's all but challenging anyone to stop him. "I'm gonna win," Grimm, 47, recently told Fox News. "When I go out and I shake these hands, and people hug me, and they tell me in my ear, 'You have no idea how many people are behind you,' I just know it." A Marine and Gulf War veteran, Grimm has long styled himself as a scrappy fighter for New York City's "forgotten borough." The thrice-elected congressman says his prosecution and eight-month prison term were politically driven and unfair. He casts himself as a political warrior ready to defend President Donald Trump's agenda against congressional Republicans with a "weak spine." And he counts the support of Staten Island political patriarch Guy Molinari, a Republican former congressman and borough president. But Grimm would face an incumbent with a long history in Staten Island politics, including 12 years as district attorney (his office didn't prosecute Grimm). Donovan has the backing of the local and state Republican parties and a $300,000 campaign war chest; Grimm's old campaign coffer has $52,000 but bears $420,000 in legal debt, according to the latest filings in July. Both camps claim the other candidate is too liberal. "We're not really worried about a challenge from a felon," Donovan campaign spokeswoman Jessica Proud says. "The voters won't be duped by him again." A half-dozen Democrats have signaled plans to run in the swing district encompassing Staten Island and a bit of Brooklyn. Democratic Congressional Campaign Committee spokesman Evan Lukaske said Grimm's candidacy "demonstrates the serious harm that this do-nothing Congress is inflicting on vulnerable Republican incumbents." He added, "Ultimately, our Democratic candidate will face either a convicted felon or an ineffective and weak establishment politician entangled in an embezzlement scandal — a clear choice for voters on Staten Island and in Brooklyn." Grimm was an attorney and former undercover FBI agent on Mafia and Wall Street investigations before he unseated Democratic Rep. Michael McMahon in 2010. In Congress, Grimm played a visible role in securing $60 billion in disaster relief after 2012's Superstorm Sandy, and he co-wrote a 2014 law that rolled back federal flood insurance rate hikes. But he also faced an FBI probe into unproven allegations that he solicited and accepted illegal campaign contributions from followers of an influential Israeli rabbi. Some said they'd contributed tens of thousands of dollars more than legally allowed, sometimes by funneling money through straw donors. A top Grimm fundraiser pleaded guilty in a related visa fraud case. A woman romantically linked to Grimm eventually pleaded guilty to lining up straw donors but insisted the congressman was unaware. Grimm denied knowledge of any improprieties. And when a New York cable news station reporter broached the investigation during an interview about the 2014 State of the Union address, the congressman threatened him on camera. "You ever do that to me again, I'll throw you off this (expletive) balcony," Grimm said. "You're not man enough. I'll break you in half. Like a boy." Grimm initially said he'd felt the reporter was disrespectful but later apologized, explaining that "as a Staten Islander, sometimes I get my Italian up." Grimm was never charged with any campaign-related offenses. But prosecutors said the inquiry exposed that Grimm, while running a Manhattan health food restaurant before taking office, hid more than $1 million in sales and wages, partly through off-the-books cash payments to workers in the country illegally. Declaring the case "a political witch hunt," Grimm was re-elected in 2014, then pleaded guilty within two months. Grimm says what he did was wrong but commonplace and would have been handled with a civil fine instead of a criminal prosecution if not for his political stature. There have been some similar prosecutions, though prison time isn't common. In arguing for it, prosecutors noted that Grimm was a lawyer and a former FBI agent. American voters have occasionally put convicted politicians back in office since 1798, when Rep. Matthew Lyon, of Vermont, was re-elected while in jail on a conviction of violating the now-long-gone Sedition Act, which restricted criticism of the government. In the letters pages of the local Staten Island Advance, some writers say they've had enough of Grimm, but others argue he was unjustly brought down. Political experts, too, are split on Grimm's chances.